From Egypt's Tahrir Square to Tunisia's central Bourguiba Avenue to the plazas of Syria's ancient cities, public squares have been at the center of the Arab Spring. But the centrality of these spaces to the narrative of the uprisings in the Middle East has largely been overshadowed by the role that social networking played in fomenting rebellion. For all the praise that has rightly been lavished upon the Arab world's youthful revolutionaries, one must not forget the gray, old spaces where they massed. "A tremendous amount of ink has been used for Facebook and Twitter," says Vishaan Chakrabarti, a Columbia University professor of architecture who frequently writes about public spaces in the Middle East. "But it's just as important for people to have face-to-face contact in public squares to plan their next steps." There's nothing altogether new about mass dissent in some of the Middle East's most venerable cities, but, of course, the urban political landscape has changed over the centuries. University of Michigan historian Juan Cole argues that 100 years ago, we wouldn't have seen protests down Bourguiba Avenue or in Tahrir Square. Instead, demonstrators in colonial times would have gathered in what he calls the "market-mosque complex," where large numbers of Muslims would meet after Friday prayers. "When people were upset with the ruler's policies, you'd have a large number of people suddenly coming out [of the mosques]. And since the market was historically nearby, it was easy to organize people," says Cole. But today, while demonstrators still use the traditional call for protests after Friday prayers, the demonstrations have moved toward newer, nationalist spaces that were initially built with heavy European influence. Take Tahrir Square, for instance, which accommodates the Egyptian Museum, the now defunct National Democratic Party headquarters and a statue of Omar Makram, a great nationalist Egyptian hero. In the early 19th century, it almost certainly wouldn't have been the center of Egyptian protests. But Baron Haussmann, a French urban planner, brought European design to Cairo, wanting to model the city on the broad boulevards of Paris. 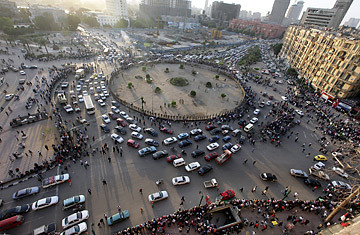 At the time, Cairo felt cramped and crowded, so Haussmann reordered the square with wide streets and large traffic circles. Some say his design made it easier for governments to put down demonstrations because it made large gatherings more easily accessible than the labyrinthine streets of the older, more traditional cities. In the 1950s, that same space was used to protest Egypt's colonial powers. "Today," says Cole, "the crowds are repositioning the ruling families as having colonized the countries, and they're using the same kind of anticolonial protests." Tunisia's Bourguiba Avenue is another example. Named for the country's first President, it is Tunisia's economic heart, and its history carries the weight of Tunisia's French colonial past. The areas around Bourguiba and Tahrir, now tourism hubs, initially served as places for commerce and for colonial elites to live. This year, they became the most prominent sites of dissent in each country. In Syria, however, older and more traditional Islamic spaces have been more prominent. The ongoing battle between security forces and demonstrators has found its ground zero in the poor agricultural town of Dara'a, home to al-Omari mosque, recently renamed Dignity Square by protesters. Pro-government forces killed a number of Syrian demonstrators outside the mosque in April while hundreds gathered in the streets to prevent troops from storming the religious site. Scores have been killed in Dara'a since. Chakrabarti views these older areas as more successful in holding and fostering demonstrations. Newer areas in Middle Eastern cities  marshaled by authoritarian governments that rose to power after colonial powers departed  are actually obstacles to freedom, he argues. "Newer squares tend to be used as set pieces that speak to the power of the governments which build them and are often cordoned off from streets and particularly from sidewalks," Chakrabarti says. "It's not to create a place of gathering. That's a crucial difference." He points to the sterile cities of oil-rich Saudi Arabia, built almost with hostility toward the memory of rowdy, noisy bazaars. "With 4 million inhabitants and growing, Riyadh is virtually devoid of the public space in which forbidden activities such as the sharing of facilities between men and women, fraternizing between unmarried couples, or protests by abused guest workers could ever occur," Chakrabarti recently wrote on his blog. The closest thing Saudi Arabia has to real public spaces are shopping malls, prized for their air-conditioning but perfect for the Saudi religious police to keep an eye on public behavior. Riyadh's Deera Square is best known for being the site of public executions (hence its grim nickname, "Chop Chop Square"). Chakrabarti argues that protests have been quicker to flare in towns with old suqs and a history of political upheaval. "It is clear that the most robust, if not always successful, protests are taking place in the ancient cities of older countries," he says, citing Alexandria, Egypt, and Homs, Syria. "By contrast, among the newer Gulf nations, we've seen far fewer and weaker protests." Of course, architecture and city planning take a backseat to the politics of bloody-minded single-party states and the extent to which security forces are willing to brutally crack down on dissent. Protests in the Syrian capital, Damascus, considered by some to be the longest continuously inhabited city in the world, have struggled to take hold. "Damascus is tightly controlled by the security forces, and a large segment of the city's upper and upper-middle classes have benefited from elements of privatization as well as from the rise on land prices in recent decades," says Columbia University professor Rashid Khalidi. "So it is a part of the country, besides [President Assad's home region], that is most supportive of the regime." But during this unprecedented time of unrest, even the most public-unfriendly spaces have become iconic sites loaded with political meaning. A couple of months ago in Bahrain, the government tore down a monument in Pearl Square, a central traffic roundabout in the capital, Manama. It had been a gathering spot for Shi'ite protesters and pro-democracy activists demonstrating against the minority Sunni regime. "The government understands the space itself is a threat," says Chakrabarti. "You need to actually denigrate the public space to denigrate the meaning of the movement." Watch "New Uprisings Against Tunisia's Old Ways."